De-cluttering your home has numerous benefits, including improved physical and mental health, but it can be a lengthy task that takes a lot of time and energy to complete. When you already have a busy schedule and lots of other responsibilities, it can be difficult to think about going through every room in your home and giving it a thorough cleaning. However, there are some simple things you can do to make the job easier, and by doing so you’ll ensure you can maintain your well-being through a clean, clutter-free home. Most people have heard that de-cluttering can have a positive effect on mental health, but don’t quite understand what that means. The reason it’s important not to have too many belongings surrounding you is that it can lead to anxiety and hinder your ability to focus and relax. For seniors, there are also physical dangers that come with too much clutter, including an increased risk of falls and other injuries. If you’re ready to roll up your sleeves and get to work, here are some tips to get started. Even if your house isn’t very big, it can be pretty overwhelming to take a look around and imagine cleaning out every closet, drawer and cabinet. That’s why it’s so important to begin in one room and work your way out. Many homeowners choose to begin in the basement or attic, since those are spaces that tend to collect a hodgepodge of items. Wherever you start, be sure to bring cleaning supplies with you — furniture polish and rags, trash bags, and a broom and dustpan will be helpful — so you can tidy up as you go. A big part of de-cluttering is staying organized so you can keep your rooms that way, so make sure you have boxes, a black marker, and sticky notes to keep track of where everything is going. For instance, create a box for items you want to sell and another for things that can be donated. Throw away trash as you work; the items you want to keep can go in a different pile to be sorted later. Keep in mind that if you want to hang onto sentimental things but don’t have the room, you can always rent a storage unit. tasks over the course of a weekend or two, but it’s important to remember that you can de-clutter all through the year in smaller steps. Once the seasons change, go through each family member’s closet and get rid of items they won’t be able to wear again, then make a quick trip to the local thrift store for a donation. Consider also applying the One In, One Out rule: Every time you buy something new, go through the closets or cabinets and get rid of an older item. This will help keep things neat all throughout the year, and ensures you’re not contributing to another clutter problem down the road. 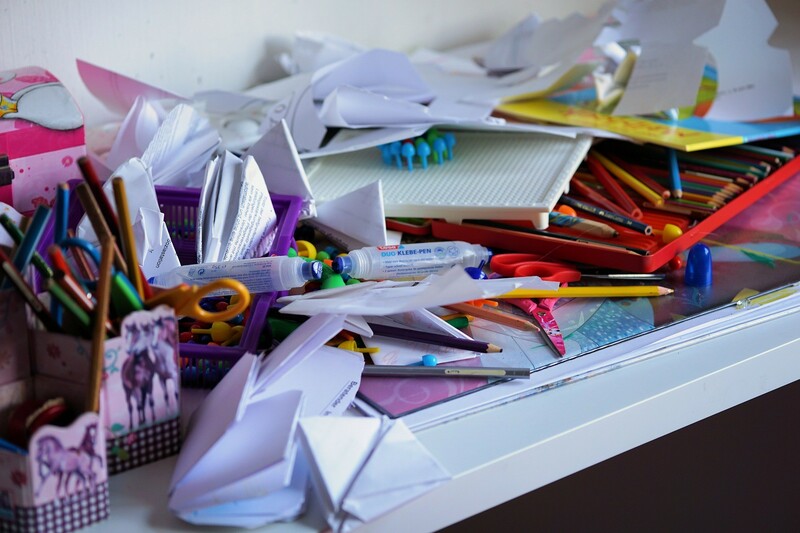 Because clutter can attract bugs and lead to mental health issues and create trip hazards, it’s important to keep things neat. Look for storage that you can use in each room so everything will have a home. If you’re tight on space, you can find furniture and decor that will double as storage for things like books, blankets, and toys. De-cluttering doesn’t have to be stressful or difficult. Breaking down the task into manageable jobs makes it easier and will allow you to work at your own pace, which is important for busy individuals. Get the family involved to make it go by even faster!